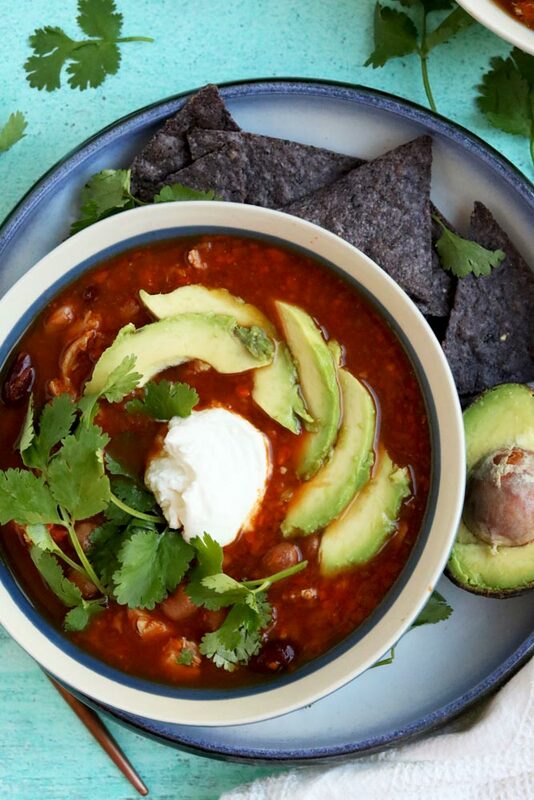 Inside scoop: This Healthy White Bean Chicken Chili is the perfect dinner for cooler weather. Dinners are the toughest for me. I have a 2 year old and a hubs who’s used to meat and potatoes, and thinks plant-based protein is “weird” – I’m talking all the goodies, beans, lentils, tofu… “weird”. So lately I’ve been in a dinner funk, especially with the cooler weather kicking in, barbeque’s not in full swing, and a lot of my energy going into figuring out these damn cauliflower buns (eventually I will write about these, please stay tuned). There was one day I was racking my brain on what to prep for dinner, and literally had nothing in my fridge (usually Fridays are like this), I had some chicken, beans, broth, carrots and celery and soup was the only thing that popped into my mind! Then the soup of all soups happened, and I am so glad because it literally kick started my recipe creative juices again, it was THAT GOOD! HEALTHY WHITE BEAN CHICKEN CHILI, DONE 2 WAYS! As mentioned, hubs not a fan of beans. So, when I whipped up this healthy white bean chicken chili I had to make some modifications, but the best part was that it was so easy to make modifications. This Healthy White Bean Chicken Chili is so simple to put together, and so delicious! I even used pre-packaged broth, from Prairie Naturals which I keep so handy in my cupboards, and my favourite kitchen tool, a mini food processor to process my veggies instead of spending that extra time chopping them. This meal took me 10 minutes to prep, so, that simple! Because of kiddo + hubby food aversions, and my aversion to grains, it’s hard to create meals that appeal to everyone. 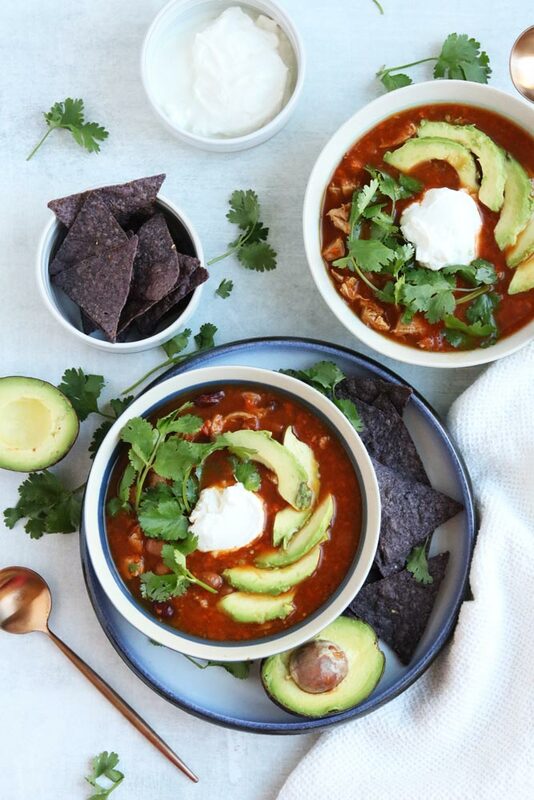 But the ease of this healthy white bean chicken chili soup just makes it great! I can get the stock going, poach the chicken, and lighten up the spices for my kiddo, easily separate into 2 pots and add white rice (for him and mini her), and beans (for me) last. 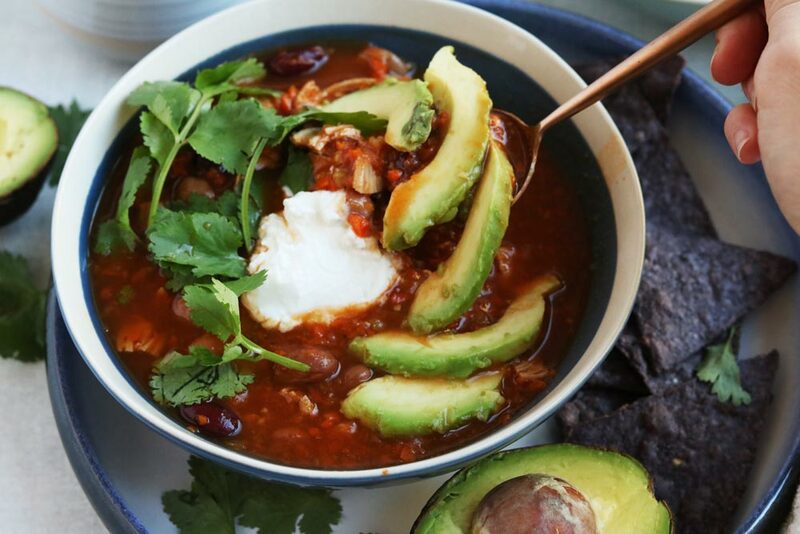 It makes creating 2 separate chicken chili’s easy, and effortless. And best part, everyone is happy. This healthy white bean chicken chili isn’t just an easy dinner, it’s an incredibly delicious one too. I definitely think getting a high quality stock is important (or making your own) for stepping up the flavour profile, but this is an incredibly nutritious and filling soup too. 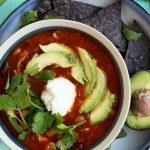 As you know, beans are an amazing, and filling food, but the simplicity of this dish, combined with real, whole food based ingredients means that this dish is incredibly good for you. You can large batch this white bean chicken chili, add more veggies, like potatoes, mushroom and corn to it, and you have a healthy, filling dinner that will last you through winter. And, if you’re looking for something more plant-based, make sure you check out our Crockpot Vegan Sweet Potato Chili, a dump and cook kinda meal! Although this meal isn’t a 5 ingredient meal, it is an incredibly simple one that will do its duty to keep you cooking healthy, in an easy way. Equipped with a mini 5 Ingredient Cookbook and 5 days worth of emails that provides you with the easiest, and healthiest tips to keep you on track, you can totally challenge yourself with this 5 ingredient mini plan. What do you think? Is this healthy white bean chicken chili something you want to try? 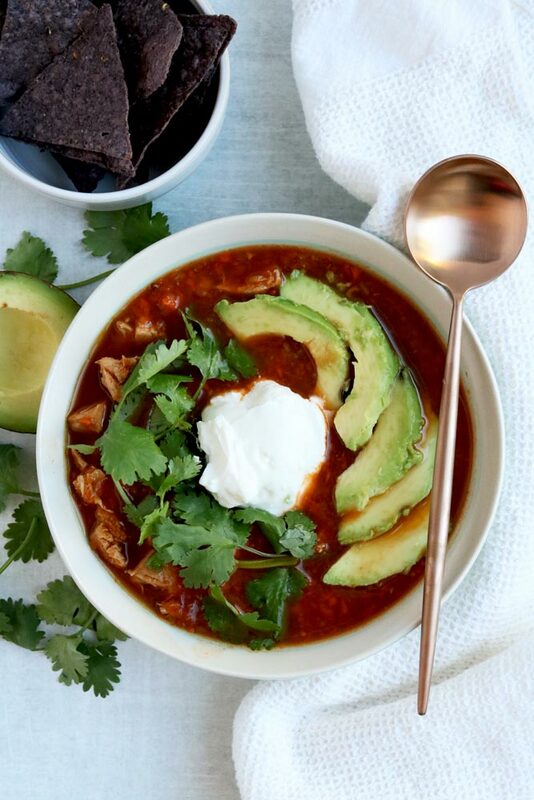 This Healthy White Bean Chicken Chili is the perfect dinner for the cooler weather. Poach chicken by adding them to a large pan, covering in water with lid and cook on medium for 15-20 minutes, flipping half way. When done, remove from heat and set aside to cool. Heat large stock pan over medium and add oil, shallot and garlic and cook until shallot translucent, about 2 minutes. Add carrots and celery and cook down for about 5 minutes. Add a dash of salt to season. Add your spices and tomato paste, and cook for about 1 minute, until tomato paste fragrant. Add broth and beans and cook down to a simmer for about 15 minutes. Meanwhile, shred your cooled chicken, or cut into chunks. Add chicken into pot and cook until carrots and celery softened. Serve with cilantro, full fat greek yogurt, nacho chips and avocado.